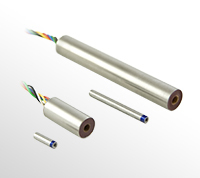 The Series 230 Miniature LVDTs have been designed to provide precision measurements over ranges from ±0.005" to ±1.0". The compact size of these LVDTs allow them to be used in applications where more "standard" size LVDTs are prohibited. The low mass core is ideal for critical weight, load sensing applications, or applications where high accelerations are expected.